After the hard graft of the first half of the year, read what’s in store for our intrepid Civil Engineers in Part 2 and, as you will see there is a lot of work to do across 2 sites, so whether you have a specific skill or just a willingness to lend a hand, if you can spare time to help James and his merry men, follow his appeal and come forward. Civil Week this year is a big one, a three-week concrete extravaganza of infrastructure renewals! Bridge 11’s time has come for renewal, Bridge 11 is the bridge immediately south of Ingrow Tunnel over the River Worth adjacent to the new housing developments. Fortunately, the abutments and piers are in good condition so only the deck requires renewal. During the first week, the old deck will be removed allowing any minor remedial works to the abutments and the piers. Once this is complete the new precast reinforced concrete bridge beams will be lifted into place. Come the second week, work will be focussed on concreting the remainder of the bridge deck and allowing that to cure sufficiently. The 3rd week will be focussed on waterproofing and then putting the track back ready for services. At Ebor Lane, the recent slope works there have gone well, but some unexpected ground conditions were found. The poor ground driving the slip was deeper and thicker than first thought and is driving the slip slightly differently. This is putting greater stress on the under-track braces which support the retaining wall. 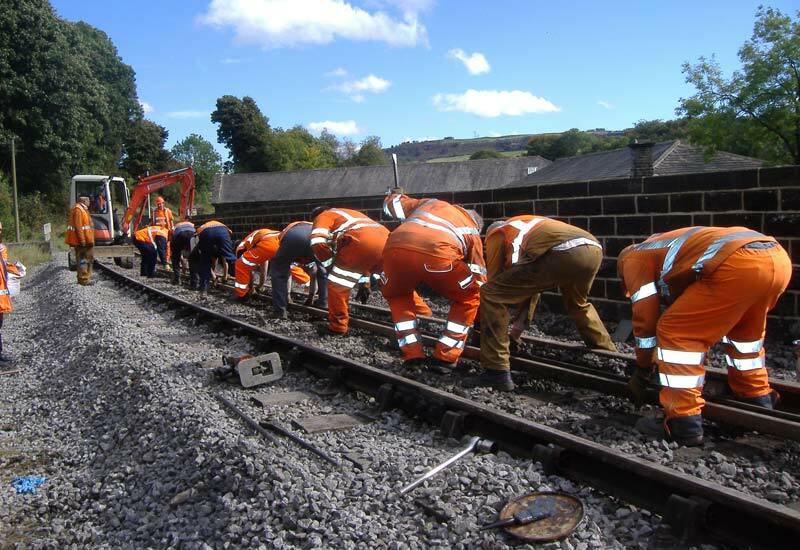 To increase the support and provide a more permanent solution the track and cross braces are to be removed and replaced with a reinforce concrete slab beneath the track. Ballasted track will then be placed on top of this concrete base, so this is not a slab track proposal! With the length of time this job will take due to concrete cure times, and the need to undertake it in stages to maintain some support, the three week block gives us a perfect opportunity. Our colleagues in operations have been very kind in granting us a three-week closure. Don’t worry trains will still be running during the weekends in the middle, just not over the whole line, with two large holes. There will be much more detailed reports and pictures to accompany these two possessions, hopefully promptly. I hope that has provided a bit of a summary of what we have planned this year. Fingers crossed no spanners appear in the works between now and the end of the year. Bridge 11 forms part of along list of bridge works which have been undertaken recently on the railway, led by the railway’s Chief Civil Engineer. His experience of bridges is certainly more than mine will ever be, the Railway has been very lucky to have his services. After Civil Week in September 2019 he will be retiring after several decades (I wouldn’t be so rude as to put exact dates here [Ed – I came and worked with him when I was at Uni, and I’m knocking on a bit]), and he will be handing over the reins to myself for all the future works, my experience certainly sits in the mud and water category. Like I said, a big year.